Radical Islamist insurgents in Somalia seized one of the country’s most notorious pirate dens on Sunday, raising questions about whether rebels with connections to Al Qaeda will now have a pipeline to tens of millions of dollars — and a new ability to threaten global trade. The pirates who fled Xarardheere still hold several ships. 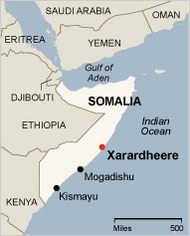 Dozens of insurgents stormed into Xarardheere, a pirate cove on the central Somali coast, around noon, but instead of putting up a fight, thepirates sped off. According to witnesses, several pirate bosses raced out of town in luxury four-by-four trucks, with TVs packed in the back and mattresses strapped on top. Islamist fighters in a fleet of heavily armed pickup trucks then occupied the strategic points in town, including the defunct police station and several crossroads. What will happen next is not clear. Two of Somalia’s biggest problems and its most troubling exports — Islamist extremism and piracy — seem to be crashing into each other. For several years, an intense civil war has raged in the country between a weak United States-backed government and radical Islamist groups that are trying to overthrow it. The ensuing lawlessness has given rise to a thriving piracy trade, in which Somali thugs in small skiffs have commandeered some of the biggest vessels on the sea, including a 1,000-foot-long oil tanker. Maritime experts estimate that Somali pirates have received more than $100 million in ransoms — an enormous sum for a nation with virtually no economy. The pirates prowl the busy Gulf of Aden, one of the most congested shipping lanes in the world, and recently struck as far away as 1,200 miles offshore. The pirates of Xarardheere currently hold several hijacked ships. But before they fled, they sent the ships further out to sea to prevent Islamist insurgents from capturing their hostages — a worrying prospect for Western diplomats and others, who fear the insurgents could exploit the hostages for political ends. An insurgent spokesman implied on Sunday that his movement would shut down Xarardheere’s piracy business. “We have peacefully seized the town and now we will bring Islamic Shariah,” said Sheik Abdinasir Mohamed Afdhuub, a spokesman for the Hizbul Islam insurgent group. But many people fear that the insurgents were actually attracted to Xarardheere because of its criminal enterprise and that different groups of insurgents will now battle for control of the town. Hizbul Islam and the Shabab are two of the most powerful insurgent groups in Somalia and were once closely allied. Both espouse a harsh Islamist ideology and have organized public amputations and stonings. American and Somali security officials said that the leaders of both groups have worked closely with wanted terrorists of Al Qaeda. But recently, the two groups seemed to have turned against each other. On Saturday, a deadly bombing at a mosque in Somalia’s capital, Mogadishu, was believed to have wounded a top Shabab official. On Sunday, another mosque was bombed, this time in the southern port town of Kismayu, where the Shabab drove out Hizbul Islam in a power struggle last year. At least two people were killed and eight wounded, in a neighborhood controlled by the Shabab. Under strict Islamic law, piracy is considered haram (forbidden), and in 2006, during a six-month period when an Islamist movement pacified much of Somalia, the Islamists curtailed piracy significantly. But now that Hizbul Islam and the Shabab desperately need money, the situation may be changing. The insurgents’ draconian rules banning music, television and bras have steadily alienated much of Somali society, making it harder for the insurgents to raise money and find recruits. Additionally, Hizbul Islam lost access to hundreds of thousands of dollars in port taxes when they were kicked out of Kismayu last year and may have needed to find a new source of cash. Jeffrey Gettleman reported from Kinshasa, Democratic Republic of Congo, and Mohamed Ibrahim from Djibouti.